IRSN – the Institute for Radiological Protection and Nuclear Safety – is the French national public expert in nuclear and radiological hazards. The organization is in particular in charge of monitoring the radiological levels over the French territory, which is basically achieved through a network of probes measuring in a continuous way the gamma radiation in the ambient air. The network is also able to send alert to an operator if necessary (Teleray network). 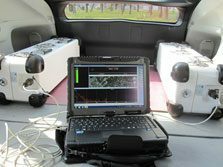 In 2012, IRSN complemented its network with mobile equipment and today, carbone and airborne measurements are regularly performed to collect data in a much denser manner over the whole territory, during peacetime but also in case of nuclear emergency. The transition in 2012 from static measurements to mobile measurements was the trigger for a new way of communicating results. IRSN manages a large amount of data and have to report them to the public. Then, the need arose for a tool helping them to communicate results in a clear and concise way. Providing maps from data was a natural choice, but representativeness of such reporting has to be a priority. 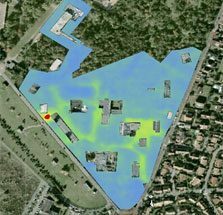 After being trained in geostatistics by Geovariances, Christophe Debayle was definitively convinced that his choice for Kartotrak software solution was well founded. Using Kartotrak, you keep your critical mind on what you are achieving. Kartotrak gives control on the key parameters for the calculation of a map by kriging. It is intuitive to use. The software offers a geostatistical workflow which requires only a few hours of training before feeling comfortable with it. Kartotrak enables quick loading of data files and is able to process a huge quantity of data at a time. It also allows automatic streaming data acquisition, and so, it is perfectly adapted to mobile data acquisition systems. Kartotrak generates very precise maps, easy to understand, better than a speech. The software allows setting the interpolation grid according to the input data, especially the variance indicator, and adjusting the interpolation area to each project, so avoiding extrapolation and false results where data is missing. Kartotrak is a professional software package. When you purchase a license, you get all the associated services, such as technical support and assistance. You do not feel lonely using the software. IRSN uses Kartotrak weekly to produce maps. Kartotrak implementation has allowed the organization to gain time processing data. Today, less than one hour separates the receipt of field data acquired through an aircraft-embedded system and the delivery of an interpolated map (including data pre-processing i.e. elevation correction). After the disaster of Fukushima in Japan, IRSN was called on to monitor the affected area. Experts on site first requested a paper version of results and then asked for a map reporting measurement values. IRSN offered to provide them with interpolated maps, which they finally agreed. Maps shown were a success because they were really easy to understand. 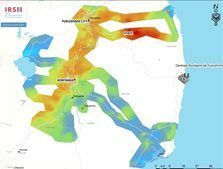 Kartotrak also revealed to be efficient and a very good software solution in emergency situations and, especially, in helping the decision makers with simple maps, like probability maps. Geovariances just finished the development. It consists in a specific plugin in Kartotrak which reads data from a distant server and stores them in a Kartotrak project in real time as data is being collected by the server.